How do you rank the best burgers in the city? By eating your way across town, of course. This is not Cincinnati Magazine‘s first time at the burger rodeo. 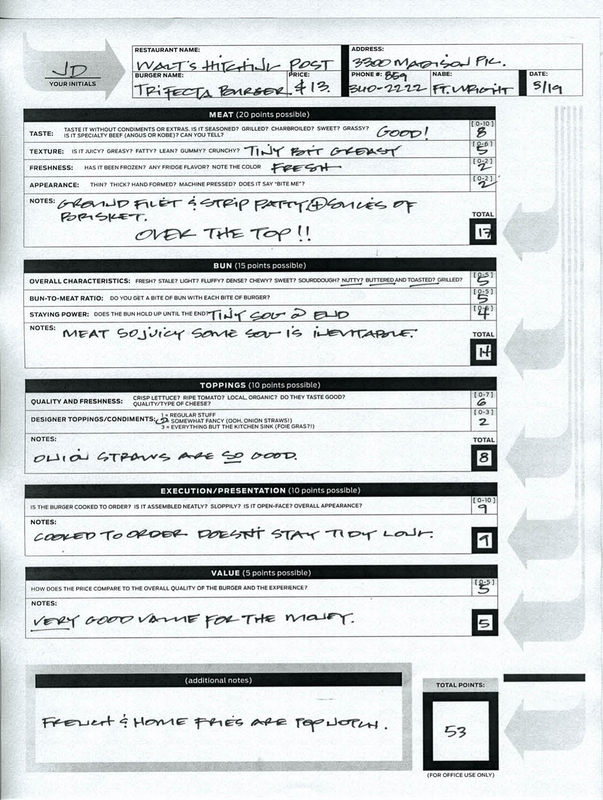 In 2010, Donna Covrett, our former dining editor, came up with ratings criteria and Design Director Grace E. Saunders devised our rating sheet. But five years and many burger joints later, we needed to make some tweaks. We took the points awarded for ambiance and assigned them to execution and presentation; and we changed the way the toppings points were allocated. The total points available remain 60. Once the score sheet was settled, Dining Editor Joanne Drilling assembled a list of burgers to try, based on the 2010 Top 40 and a slew of places that have open since–67 restaurants, diners, bars, and cafes that got divvied up between members of the editorial staff, who ate their weight in beef (Drilling and Director of Editorial Operations Amanda Boyd Walters each sampled 11). Need evidence? This annotated score sheet reveals the method to our burger madness. PHOTO FINISH: Testers were charged with submitting photos of their burgers along with their scores; every one of our tasters except Editor-in-Chief Jay Stowe has a camera-equipped smartphone (he used his wife’s). KEEPING SCORE: Walters created an Excel spreadsheet (with formulas to do the math) so tasters could enter their scores as they went. MAKE A NOTE: Drilling wanted to highlight condiments, sides, and buns in the package, so those items got shoutouts in the bottom section of the form. TIE BREAKERS: Any overall-score ties were broken in favor of the burger with the higher scoring meat, bun, or toppings.